Bluegrass Pundit: CAIR responds to Paris attack: Condemns "anti-Muslim bigots"
CAIR responds to Paris attack: Condemns "anti-Muslim bigots"
Isn't it time to put CAIR on the list of terror-supporting organizations? (CNSNews.com) – The “proper response” to attacks like the one targeting a satirical French magazine in Paris Wednesday is not to vilify any faith, but to “marginalize extremists of all backgrounds who seek to stifle freedom and to create or widen societal divisions,” the Council on American-Islamic Relations (CAIR) said Wednesday. 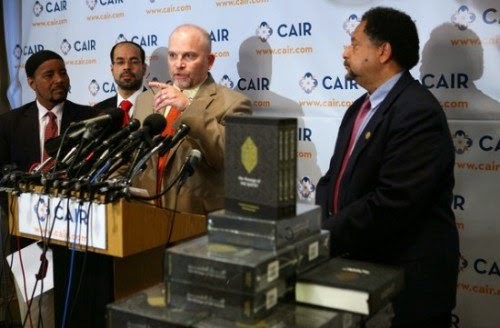 “We strongly condemn this brutal and cowardly attack and reiterate our repudiation of any such assault on freedom of speech, even speech that mocks faiths and religious figures,” CAIR national executive director Nihad Awad said in a statement. Asked whether the group’s reference to “extremists of all backgrounds” included those who offend Muslims by, for instance, publishing cartoons satirizing Mohammed, CAIR spokesman Ibrahim Hooper agreed. “We were talking about the twin extremes of ISIS-type extremists and anti-Muslim bigots,” he said in an email.